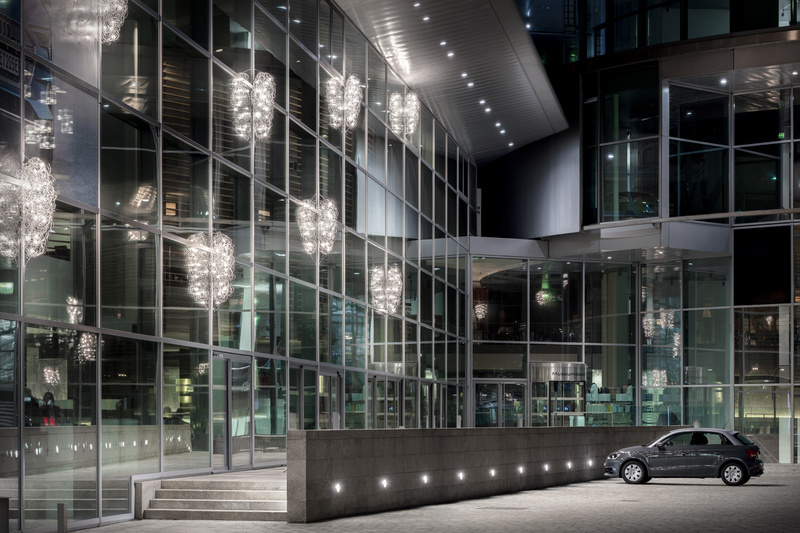 A stunning composition of Cascata Fil de Fer wall-lamps, custom-made, was installed on the façade of elegant building which hosts the headquarters of Audi at Ingolstadt, in Bavaria. Audi Forum Ingolstadt is visited by around 400.000 people a year, being a popular point of interest for Audi-car enthusiast from all over the world, who can take a tour into the factory, visit the exhibition spaces and the Audi Museum mobile, focused on the brand history and characterized by an unusual architectural structure. The large complex of about 80.000 sq. meters hosts themed restaurants and a movie theatre, awarded for showing high quality international movies. Concerts, events and conferences are held at the Forum, which is a very popular meeting place, throughout the year. The winter atmosphere at the Audi Forum has become even more appealing to the visitors from December 2018, when the lights by Catellani & Smith have shone bright on the polished glass façade of the main building and illuminated the surrounding area, similar to real cascades of falling, magical light.